Don't confuse Remember the Titans with other high school football films (like Varsity Blues), this is the story behind one of the most racially integrated towns in the United States. In the sixties when schools were integrated two high school football teams were joined under a black coach. This caused all sorts of friction, made worse by the fact that the current coach is highly successful and well loved. It is a story of character and honour and building friendships across cultural divides. 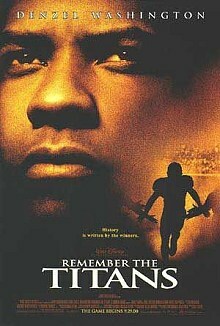 Told mostly from the point of view of a fictionalised version of the real-life coach's daughter, Remember the Titans is a timely call for understanding and consideration, and a reminder that friendships are earned, and can be found in the people who seem on the surface to be incompatible with us and our lives.